Functional Ram Air Ducts 08-up Dodge Challenger RT & SRT Functional Ram Air Ducts 08-up Dodge Challenger RT, Functional Ram Air Ducts 08-up Dodge Challenger SRT, Cervini's 7278 Challenger Hood Ducts, Dodge Challenger Functional Hood Ducts, Challenger Functional Hood Ducts, Dodge Challenger Functional Ram Air [Cervinis 7278 Challenger Ducts] - $159.95 : 3rd Strike Performance, Your Source for Late Model MOPAR Performance Parts and Accessories! Maximize cool fresh airflow into your engine compartment by converting your blocked off hood scoop openings (RT models). Replace the block-offs with these oem scoop ducts. Reduce underhood temperatures and improve performance with this factory optioned upgrade! Includes the LH & RH hood scoop ducts. Combine these ducts with our Ram Air Kit (Part#4385) to make your factory hood totally functional! 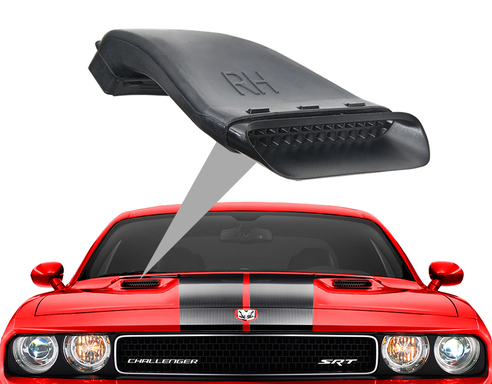 This part is required for the Cervini Challenger Ram Air Kit to function properly, if your Challenger is not equipped with these functional vents from Dodge.